I was brought to the brink of destruction because of agricultural chemicals – chemical fertilizers and insecticides. I can smile like I do today only because I stopped spreading those chemicals. I raise my crops naturally, without relying on pesticides or chemical fertilizers, just like the old days. I want to tell everyone about the wonderful power that Nature has. I come from the town of Nishiki in Kuma district, Kumamoto Prefecture, born the eldest son of a Japanese tea-maker. We began chemical-free tea production in 1978 and in 1985 we were awarded the Minister for Agriculture, Forestry and Fisheries Prize. In 2007 we acquired the Organic Japanese Agricultural Standard (certification number 0707-A04) and now we provide guidance to tens of young locals in the ways of chemical fertilizer and pesticide-free tea production. The tea is produced deep in the mountains, completely free from the clamor of the city. We also process all our tea on-site, so the cleanliness of the air and water is consistent right from planting to processing. The area is famous locally as the "Origin of the Mist" and the large temperature swing between morning and night helps to make the most delicious tea. On our estate, the things that are natural – the soil, insects, water, and of course the tea – work together collectively and naturally. This is why, instead of using insecticides to exterminate pests, we look for assistance from beneficial bugs – the spiders, mantises and ladybugs – to do the job for us. We also harness the power of trillions of beneficial bacteria to keep the earth fertile. Good earth is rich in minerals, so much so that fawns and wild boar piglets come to eat it in the early spring. Ochacha Honpo products are processed with painstaking care, but we leave the growing to Nature. Fujisako Tea Estate is located in the hilly terrain of the Hitoyoshi Basin, surrounded on all sides by mountains over 700 meters tall. The 230 meter elevation guards against airborne pesticides and other harmful substances from outside. Tea plants at a normal plantation only thrive for a dozen years or so. If the tea plant itself has the ability to live for several hundred years, then why can they only produce for just over ten? The use of pesticides and chemical fertilizers causes the tea plant’s natural immunity to drop, inhibiting natural resistance to disease and pests. It’s said that the potency of the antioxidants and the immunity levels of the tea plant are so high insects aren’t attracted and don’t eat it. It’s though that excessive absorption of pesticides and chemical fertilizers quickly causes the plant’s natural immunity and antioxidant levels to deteriorate. The 1985 Minister for Agriculture, Forestry and Fisheries Prize-winning plantation. 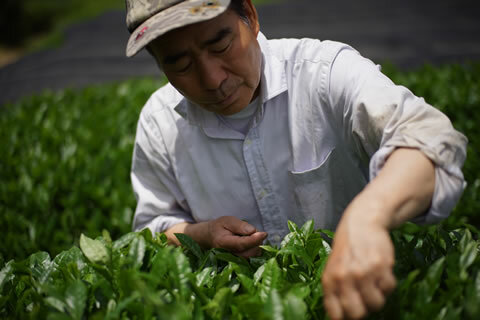 Teas including Yabukita, selectively bred from species indigenous to Japan, and the indigenous Yamacha still thrive after many years of repeated natural crossbreeding. They are produced in the village of Sagara, Youra ward. An obsession with selective breeding has been caused by the huge importance placed on taste and color. Breeds that are produced naturally hold within them Nature’s living force. Yabukita is originally a selectively bred tea that makes up over 90% of the tea grown in Japan today. Indigenous varieties (tea plants that have passed on their seeds over the course of many years of natural crossbreeding and are unique to Japan) were selected and crossed for their color and flavor as well as high resistance to cold and disease. 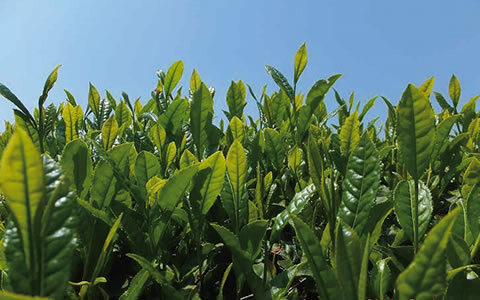 Yabukita is now an established tea, along with other cultivars such as Tamamidori. 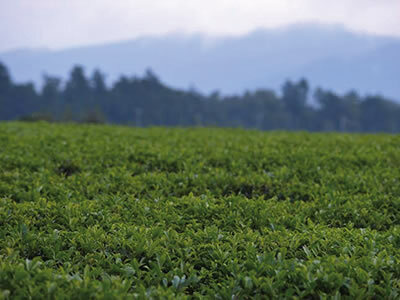 Without agricultural chemicals or chemical fertilizers it is difficult to produce superior quality teas, even Yabukita. In contrast to the indigenous Yamacha, present in Japan since long ago and still grown today, Benifuuki is an artificially bred variety that is established today as a high quality tea. Benifuuki’s ancestor, Benihomare, was originally brought into Japan in the latter 1880’s from the Assam region of India, famous for its black tea. From the Indian black teas, those best suited to Japan’s environment were chosen and became popular throughout the country, coming to be known as “Indocha”, literally “India Tea”. Despite Benihomare being selectively bred to popularize Japanese black tea all over the world, it is known today as a “phantom” black tea. Benihomare was artificially cross-pollinated with MakuraCd86, a selectively bred relative of Darjeeling, to create the high-profile Benifuuki we know today. Along with Benifuuki and Benihomare, Benjifuji is another imported variety. At Fujisako Tea Estate we mainly grow the indigenous Yamacha and its selectively bred varieties Yabukita and Tamamidori. Benifuuki, which is well suited for black and semi-oxidized teas and has its origins in India, certainly has value, but at Fujisako Tea Estate we are insistent on producing purely Japanese products. We believe in the importance of preserving not only the fragrances, flavors and colors of Japan’s traditional indigenous varieties, but also the “living force” that resides within Japanese Tea. Excessive focus on improving efficiency has led to the introduction of heavy machinery into tea cultivation. These heavy machines, with their enormous caterpillar tracks, are driven through the tea fields. The soil, which must be fertile to make tea, is firmly trodden down. The roots of the tea plants don’t grow sufficiently large and cannot extend deep into the earth. This means nutrients cannot be absorbed, resulting in short-lived tea plants. A shortened lifespan is attributed to the loss of the tea plant’s vitality. When it comes to selling the tea, the general belief is that after around fifteen years quality begins to deteriorate. Without disputing whether this is true or not, the tea plants are eventually uprooted and replaced. The truth is that by refraining from the use of heavy machinery, pesticides and chemical fertilizers, the tea plants can live well beyond this age. It’s commonly believed that the introduction of heavy machinery for mass production corresponds to reduced numbers of agricultural workers, leading to lower labor costs and increased profits. Nothing could be further from the truth. The price for one of these machines ranges on average from 5 to 10 million yen. One tea farmer usually owns two or three large farming machines. At the very least every farmer has debts of 10 million yen. The heavy machinery was introduced to facilitate mass production and boost profits, but the farmers are causing their own downfall with the very mass production methods they are using. Production in large quantities lowers the unit value per kilogram of tea. In 2014, at the tea farms that use heavy machinery, pesticides and chemical fertilizers in the area around Fujisako Tea Estate, the new tea from the most valuable “first flush” sold at a high of \4,000 per kilo. The average price was around \2,000, falling to \1,500 the next day. Within the space of a week the average price had dropped to just \500 per kilo. This is simple market principles in action. The more heavy machinery is used to expand mass production, the more pronounced the fall in the tea’s market value becomes. It is a simple prediction to make that cheap foreign imports of a similar quality will enter the Japanese market. If that happens, Japanese tea farmers who cultivate using ordinary methods will be unable to compete. If they can somehow hold their own, it will be through methods that continue to lower prices for the sake of increased efficiency and mass production. Of course, at Fujisako Tea Estate we do not use heavy machinery. We use a hand-held tea plucker, a small machine that only weighs around 10kg. 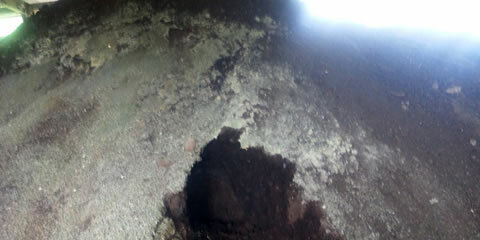 When walking around Fujisako Tea Estate we take the utmost care not to trample the soil. The soil is so light and soft that visitors say it is like walking on a carpet. 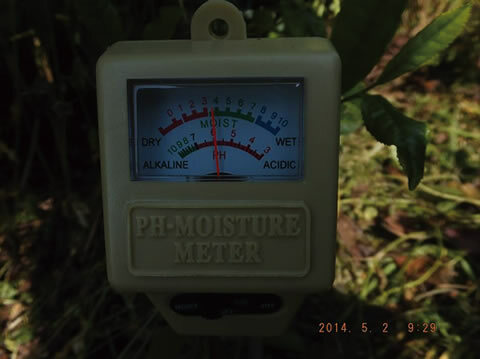 Acidic soil of pH 4 – 5 is said to be the the most suitable for growing tea, but at Fujisako Tea Estate our soil is almost neutral, at pH 6.7. Pictured: an analog soil meter in May 2014. The soil moisture ratio is just under 40%. The measurement was taken on a clear day at a depth of around 5cm. 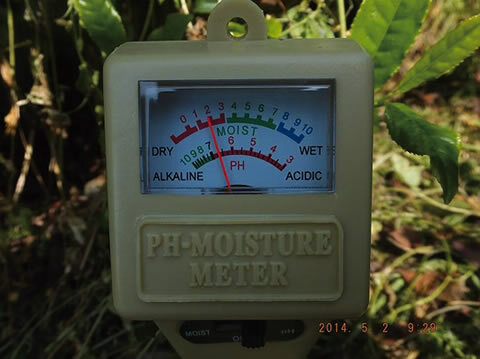 If the same measurement was taken at a tea farm that used heavy machinery or chemical fertilizers and pesticides the meter would read “DRY”. Preserving the soil’s water content is paramount to maintaining a healthy farm. Tea leaves are usually grown from seedlings, but at Fujisako Tea Estate, we cultivate our teas from the seed itself. Our seeds are not “F1 hybrids” but pure bred domestic varieties or those that have been selectively bred from domestic varieties. It takes approximately fifteen years before tea plants cultivated from seeds can first be harvested. 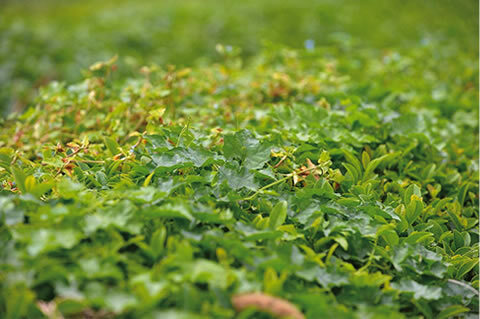 For plants grown from seedlings, harvesting is usually possible after about three years. It was either three years or fifteen. Considering the obvious differences in the time and effort required, the decision was by no means an easy one to make. Many business people visiting us from abroad come searching of "real Japanese food". Pictured: Mr. Schweikart from “gruenertee.de”, Germany. Domestic varieties were planted here 64 years ago and, as of 2014, 37 years have passed since we began completely chemical fertilizer and pesticide-free cultivation. During that time we have not used chemical fertilizers, agricultural herbicides or insecticides. This kind of cultivation management takes considerable effort. We are often asked if we really run a tea estate because of the sheer number of weeds growing here! These days, many tea farms prune their tea plants in a shape we call “square-cut”. This give the tea plants their distinctive sharp, well-defined shape. The correct way to describe our tea plants is “round”. This is the old-style traditional shape that we preserve to this day at Fujisako Tea Estate. These days, business with foreign companies exceeds that within Japan. We are highly regarded overseas for employing truly non-chemical fertilizer, non-pesticide production methods, and for our natural approach to tea cultivation. In 2005 we acquired the Organic Japanese Agricultural Standard, but due to the high renewal costs, a lack of widespread knowledge nationally and no great cost benefits, we annulled our certification in 2013. The real reason for the cancellation of the Japanese Organic Agricultural Standard was non-renewal – the cost really is much higher than people think. Foreign companies speculated that acquisition and renewal fees for organic certification in Japan are so high because of a lack of expansion of the market share of organic produce and products. To give Germany as an example, organic produce makes up around 12% of national agricultural output, compared to 0.2% in Japan. With increasing transactions with foreign businesses, especially in Europe and countries with developed markets for organic products, we couldn’t gain recognition as an organic producer without proper certification. This is why we acquired the Organic Japanese Agricultural Standard for a second time in 2014 (certification number: SEZ-26030551). The raw materials for the organic fertilizer we use at Fujisako Tea Estate don’t contain chemicals or material from livestock sources, such as cow, pig or chicken dung. The main reason for this is that animal by-products contain invisible carryover – residues from inorganic animal feed. All our raw materials are produced in Kumamoto Prefecture, on Kyushu, a large island in southern Japan. We’re very particular about where we source our raw materials, particularly after the earthquake and tsunami of March 11 2011 and the radioactive contamination that followed. We perform rigorous traceability checks to ensure the raw materials we use aren’t contaminated. We use brown sugar or the husks of non-genetically modified soy beans, blended with dried sardines or seaweed as the main raw materials for our fertilizer. 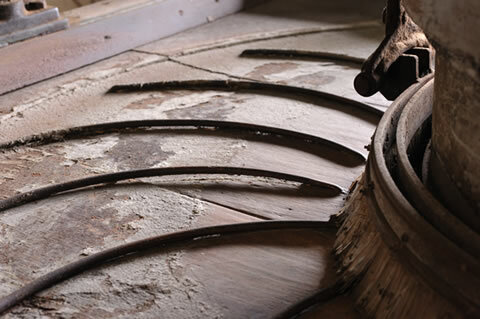 This is then broken down by several kinds of helpful bacteria that exist symbiotically in a give-and-take relationship – if one kind of bacteria is not working, the others will perish and the fertilizer will rot and become useless. To ensure this doesn’t happen, we pay the utmost attention to the maintenance and management of our fertilizer. Fertilizer takes about half a year to make. During decomposition the activity of the bacteria raises the temperature inside the mulch to around 70º Celsius. This fertilizer is the little “helping hand” we give to the tea. The bacteria are multiplying in the soil on the estate right this minute. We almost never have to apply additional fertilizer – the earth itself is alive. This is nature’s way. 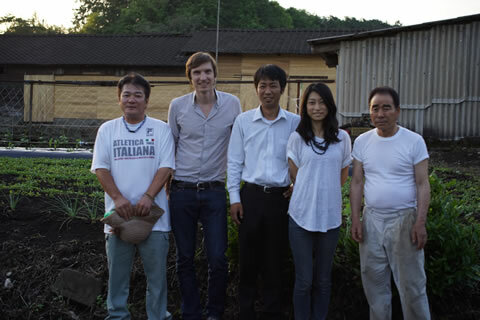 At Fujisako Tea Estate we only use raw materials that come from Kumamoto Prefecture in our original organic fertilizer. To eliminate carryover from pesticides, chemical fertilizers and radioactive material, absolute care must be taken with regard to the substances we use. Fujisako Tea Estate is surrounded by mountains over 700 meters. A windbreak forest protects the estate from airborne pesticides that are carried in on northwesterly winds. The tea farms in the surrounding area do use chemical fertilizers and pesticides. We sacrificed a portion of our estate to plant a windbreak forest. The trees over three meters tall and grow naturally, protecting the tea plants. This maximizes our defenses against the airborne chemicals from the northwest. The windbreak forest has been growing for over 30 years. The combination of this and other protective measures has eliminated residual pesticides from the estate. Agricultural chemicals have not been detected at Fujisako Tea Estate (certification held). 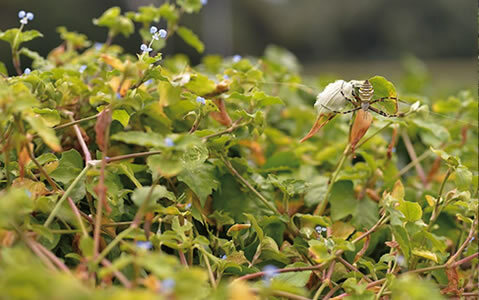 The tea estate is inhabited by spiders, beetles and mantises and we remove weeds by hand only during the tea picking season. We aim to maintain and environment that is as close as possible to nature, but weeding really is hard work. It takes considerable time and effort to grow tea and, from the point of view of labor, large machinery is extremely useful. The use of heavy equipment offsets the workload, but we don’t use any at Fujisako Tea Estate because of the excessive weight. The caterpillar tracks of heavy machinery compact the soil impeding the tea’s growth. The roots of the tea plant cannot grow large nor can they extend deep into the soil. This means the tea cannot properly absorb nutrients and each plant’s lifespan is shortened. When presented with the choice between the life of the tea or reduced labor, we chose the tea. We employ techniques that do not place a burden on the soil. We use hand-held equipment instead of vehicles equipped with caterpillar tracks. By not using herbicides or insecticides plants can grow in the earth, just like in the photograph. In 1946, after the Second World War, the first generation tea master, Tsunao Fujisako, first opened the tea estate in the village of Sagara, Kuma District in southwest Kumamoto Prefecture, on the southern island of Kyushu. Known as the "Origin of the Mist", the estate is surrounded on all four sides by mountains rising up 700 meters or more. The extreme temperature difference bewteen morning and night makes this valley the perfect place for growing tea. Tea cultivation began here when 70 families received 100 sacks containing the seeds of Japanese tea. However, of those 70 households, only 30 were able to grow anything. When the tea leaves eventually budded, only three tea farming households had managed to grow enough to make saleable products. 96% gave up along the way. Cultivation from seed is truly a difficult task. It takes as many as fifteen years to raise tea to a stage where it’s ready to be plucked. Until then it isn’t clear if the plants will even bud or not. One of the main difficulties is that running a tea estate is an expensive business, especially when you can’t develop any products for the first fifteen years. In order to pay for the upkeep of his tea fields, the first generation Fujisako tea master Tsunao moved to Tohoku, a region of northwest Japan. He worked in construction for ten years, regularly sending money back home to Sagara on the island of Kyushu, south Japan. At that time, no other tea farmers in Japan were cultivating their tea from the seed. The cultivation process itself is slow. It takes a long time before merchandise can even start to be made and there will be no income before this. This is the harsh reality of growing tea from the seed. Fujisako Tea Estate began in 1946 and was inherited by Kenichi Fujisako, second generation tea master and son to Tsunao, in 1976. In 1945, after Japan’s defeat in the war, everything in Japan, from politics to the economy, was conducted in accordance with American policies. One of those policies concerned mass consumption and mass production through the use of pesticides and chemical fertilizers. In America the damage caused by such chemicals had already become a serious problem. Widespread use in America shifted the weight of public opinion against the application of chemicals and their use had to be minimized. Plummeting sales signaled a make-or-break situation for the the major distributors in agrochemicals and pharmaceuticals. Their attention turned overseas – to Japan. If they couldn’t sell their chemicals at home, then they would have to sell them abroad. This phenomenon still continues to this day. Everyone had to follow the orders of certain groups involved in the tea trade without question. If pesticides and chemical fertilizers were not purchased, deals would not be brokered and no financing could be received. Fujisako Tea Estate was no exception, but the second generation tea master Kenichi refused anyway. “Pesticides and chemical fertilizers are a danger to human health and damaging to the environment. But if sales go up, surely it’s fine to use them.” While contemplating the pros and cons of their use, Kenichi suffered damages due to chemical fertilizers and pesticides and his business was brought to the verge of bankruptcy. That was in 1977. It was then that Kenichi made his mind up. 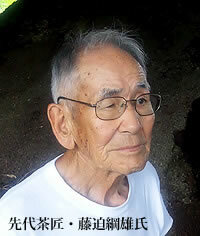 Kenichi took the first chemical free step in 1978. As soon as he stopped using chemicals, the estate was hit by an epidemic. Yields fell sharply and the tea tasted terrible. The price slipped to almost nothing. Even so, he still didn’t use chemicals! That’s how strongly Kenichi felt. Neighbors would mock him, saying things like, "Kenichi’s a fool, doesn’t he know any better?" or "He doesn’t use nitrogen fertilizer. He won’t grow tea that way. What an idiot". First Kenichi removed the remaining chemical fertilizers and pesticides from the soil using electrolysis. He wanted to return the estate to its natural state as fast as possible. Electrolysis on a farm of 8 hectares cost somewhere in the region of \2 million, but somehow, Kenichi gathered the funds. Even after the electrolysis treatment, he still couldn’t produce any tea. He had to leave the field to recover for seven years. The estate became infested with bugs. Weeds grew unrestrained, but not tea. The neighbors began again, "Fujisako’s tea farm is overgrown with weeds. He’s either given up growing tea or gone mad". "Ah, it’s back! At long last it’s back!" And so it was. Little by little the tea growing conditions improved. These tea machines were installed over 50 years ago and are still in use to this day. If it ain’t broke, don’t replace it” – the mindset of the Japanese people when it comes to machinery. Whether it’s people, material items or nature, we must treat everything with the respect it deserves. 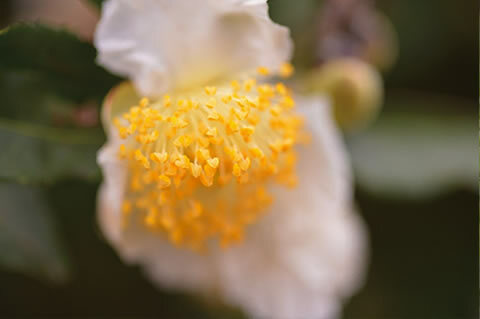 The white petals and yellow stamens are the flowers’ trademark. These tea trees have continued to propagate their seeds since ancient times, pollinated by wind borne pollen from other regions. The tea plants bear seeds from October through November. This is what Kenichi was able to appreciate. The idea is to leave the tea’s growth to the forces of Nature. There never used to be any dependence on chemical fertilizers or agricultural chemicals. Everything simply returned to Nature. As for the tea produced with these methods, the quality had risen high enough to claim the Minister for Agriculture, Forestry and Fisheries Prize in 1986. Over 60 years have passed since cultivation began in 1946. 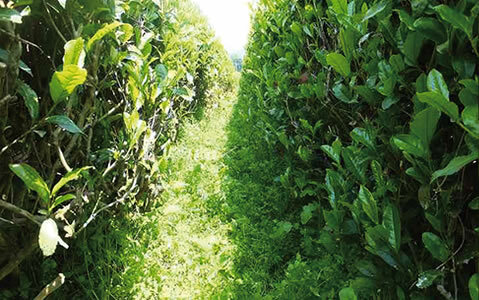 A large number of farms leave their fields fallow for five years and claim to have chemical-free products, but Fujisako Tea Estate has a different history. This tea estate is enclosed on all sides by tall mountains and is protected from airborne poisons by its surroundings. North-westerly winds ensure that volcanic ash from Sakurajima and Kirishima in the southeast isn’t deposited on the estate. There are probably no tea estates in the whole of Japan that are protected quite like ours. As of 2014, since the first seeds were sown and cultivation began at Fujisako Tea Estate in 1946, 68 years have passed. Those seeds were rare in that they were not subject to selective breeding, and their genes have been passed on naturally since ancient times. The village of Sagara in the Youra District, Kumamoto Prefecture, the location of Fujisako Tea Estate, is said to be where Yamacha, one of the foremost ancient teas grown today, was left to grow wild. The proliferation of Japanese tea culture began when the Zen master Eisai brought tea seeds and production methods back to Japan from China. It has only recently come to light that what Eisei actually returned with was a Chinese tea production method, known today as Aoyagi. In Eisai’s groundbreaking text, "Drink Tea and Prolong Life", it suggests that Eisai himself popularized tea in Japan and this has been accepted to this day. But can it be said with confidence that tea plants simply didn’t exist in Japan before Eisai? "… 500 years prior, in the era of the Emperor Shomu (AD 701 – 756), tea for medicinal purposes was already present in Japan". It’s rational to think there is a high probability tea existed in Japan even before this. The reign of Emperor Shomu’s took place over 500 years before the exploits of Eisai. Judging from the fact that records dating from that period state tea was already in Japan, we can say it’s likely Yamacha was growing wild in the mountains nationwide, particularly to the west of Tokyo. At Fujisako Tea Estate we use Yamacha to make Oolong, a semi-oxidized tea. 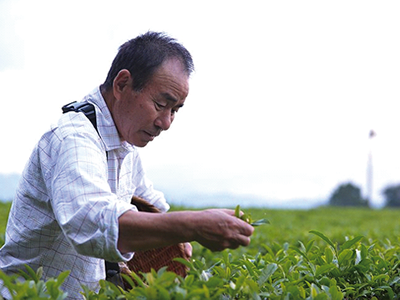 The second generation owner Kenichi first began making Oolong tea 20 years ago. 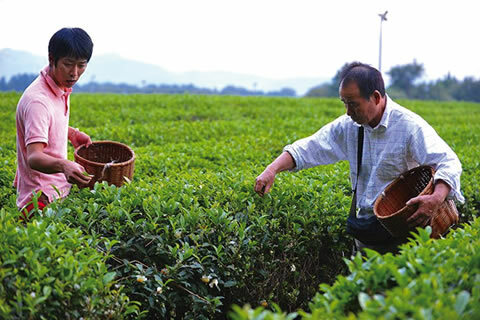 If a farmer says he was the first to start making Oolong tea, then he can easily sell his products to organic shops. All he has to say is "I was the first", and that’s that. Perhaps what’s written in Eisai’s "Drink Tea and Prolong Life" is somewhat similar to this. In the area around Fujisako Tea Estate, many plants that are used in traditional Japanese medicines besides tea, such as alehoof, mugwort and Solomun’s seal, also grow wild. Wild vegetables like bracken royal ferns and aralia are also widespread. Friends and relatives come down to the estate to forage when these vegetables come into season and we make tempura in the factory. When the time comes for the first flush, we eat a special dish – tempura made from the new tea leaves. It goes without saying that if our tea was not raised chemical-free, we wouldn’t be able to eat the fresh tea leaves in this way. Not only the tea, but the whole of Fujisako Tea Estate is left as Nature intended. Depending on the time of year, one might be able to catch sight of wild fowl, such as pheasants, or deer and wild boar piglets. The perfect length of wilt and precise timing of the deep-steam are decided based on the exact combination of the past year’s weather and the current growth situation of the tea leaves. Automation certainly brings about maximum productivity in tea-making, however, the very best methods for drawing out the tea leaves’ flavor can only be achieved with the wisdom of a master tea maker. Compared to the needle-shaped leaves of regular Sencha, the curled leaves of Deep-Steamed Tamaryoku-cha can be reused several times more. Sencha usually lasts up to three infusions, whereas Tamaryoku-cha can still be adequately enjoyed after up to seven. In the three days prior to plucking, the tea leaves are shielded from direct sunlight to further enhance the delicious flavors of our Deep-steamed Organic Tamaryoku-cha. Tamaryoku-cha made using cold water is refreshing with depth of flavor. Infuse in hot water and enjoy yet a different taste. Organic Tamaryoku-cha is a beverage you can enjoyed in both summer and winter. In 1978, coinciding with the halt of post-war tea production that relied on pesticides and nitrate fertilizers, Fujisako Tea Estate began experimenting with organic semi-oxidized teas. The decision to branch out was made after witnessing the appalling conditions in which Oolong tea was being made at a tea plantation overseas. At that time, there was no reason to believe the locals would even drink something of such poor quality. The only reason this Oolong tea was being made was because many countries, including Japan, would import it, despite the rock bottom price. This time, the pesticides or chemical fertilizers weren’t the problem, it was the conditions in the factory – the Oolong tea was piled high in puddles of tainted green tea. If this were to enter Japan, it would surely end up in a plastic drink bottle. In those days, factory floors in that country weren’t well monitored, and we can only hope that a safe environment has been ensured today. Nobody would dream of giving such a concoction to their children if they knew how it had been made. We were determined to create a semi-oxidized tea that could be drunk with peace of mind by children and adults alike. In those days, some tea makers were manufacturing black tea, but semi-oxidized teas, including Oolong, were almost certainly not being made in Japan. People found it amusing that someone would even try. Production continued on an experimental basis from 1978, but there were many failed attempts – a green color with a flavor like black tea, or a brown shade, but a green tea taste. The Oolong tea we make in our factory today is the result of years of trial and error. 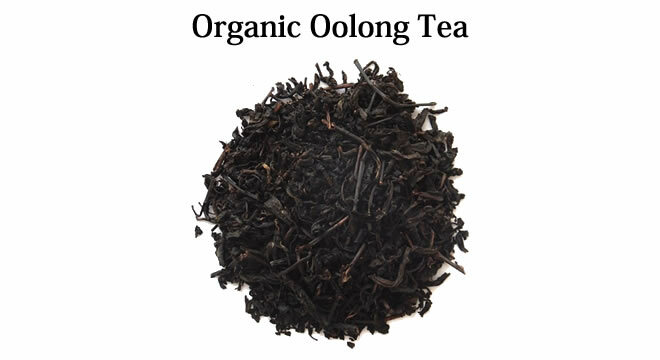 Our Organic Oolong Tea doesn’t have the bitterness usually associated with Oolong, and the flavor is closer to that of black tea. We don’t fully oxidize our Oolong, like we would black tea, and this semi-oxidation brings out the delicious flavors unique to Oolong tea. Oolong tea is delicious served hot, or refrigerated after infusing and drunk as a highly refreshing chilled drink. Our Organic Roasted Tea is made by roasting our own unrefined Organic Tamaryoku-cha at a high temperature for twice as long and at twice the temperature as regular roasted tea. The color of the leaves is near jet black and the caffeine content is extremely low, making Organic Roasted Tea the perfect beverage for small children and those on a low-caffeine diet. 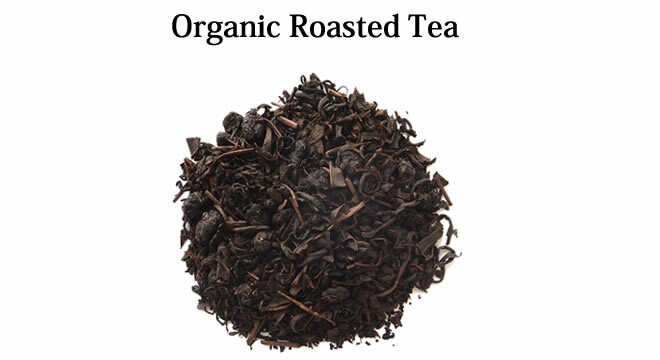 Our Organic Roasted Tea has a clear aftertaste and almost no bitterness. The high temperature and lengthy roasting time makes for a smoky, characterful tea. 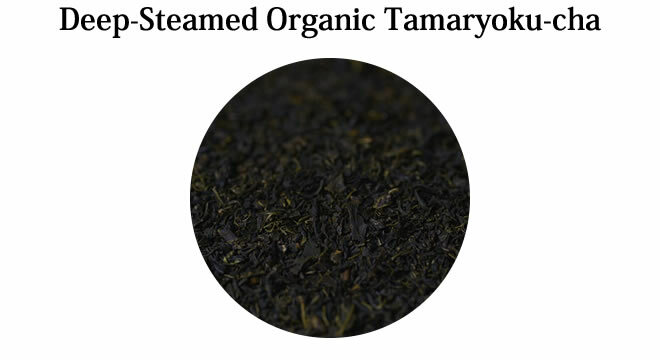 The base for our Organic Roasted Tea is our own unrefined Organic Tamaryoku-cha. This means the tea leaves curl up into tiny balls known as “gyoku” (visible in the photograph to the right), indicative of high quality Tamaryoku-cha. The unconventional shape of the “gyoku” means they are usually removed during quality control processes. However, the presence of “gyoku” is actually a highly sought-after quality, and tea aficionados come to our factory from far and wide in search of tea leaves of such a rare and valuable shape. While the obvious way to prepare our Organic Roasted Tea is in a teapot with hot water, we think it also makes for a delicious chilled beverage, refrigerated after a hot water infusion. After picking, our organic tea leaves are left to fully oxidized naturally and then fully dried to make our Organic Black Tea. When we make our Organic Black Tea, we are tracing back the history of Kuma District and the neighboring city of Hiyoshi, replicating the production methods used at the start of the Meiji Period (1868-1912). The use of machinery is standard practice in modern tea cultivation, but at the Ochacha Honpo factory, our tea is handmade all the way, right up the final drying process. 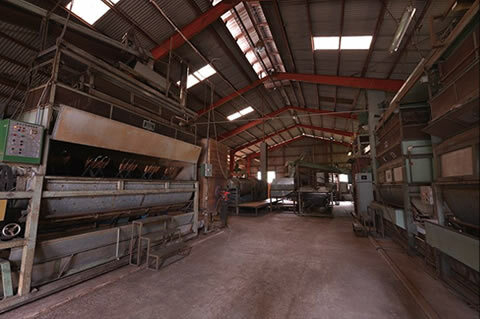 The majority of tea in circulation today is manufactured using semi-orthodox and unorthodox practices, like CTC (Crush-Tear-Curl) or rotorvane machines. 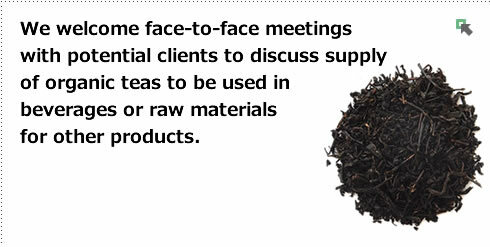 These are highly efficient methods and manage to increase output while keeping the shape of the tea leaves consistent. 1. Wilting – the tea leaves become easier to handle in later stages. 2. Crumpling – tiny fissures are made in the tea leaves to increase contact with the air, hastening the oxidation process. 3. Rolling – the hardened tea leaves are rolled to soften them. 4. Oxidation – although the tea has already been well oxidized during the crumpling and rolling phases, further oxidation at this stage is crucial in determining the final flavor of the tea. We pay particular attention to the condition of the tea leaves during crumpling and rolling. These stages must be repeated several times, and this requires significant effort to complete. Similar to green tea, machinery is indispensable for increasing production output for black tea too, but at our factory, we favor manual procedures over full mechanization. We never use shredding machines, so our tea leaves keep their natural shape. 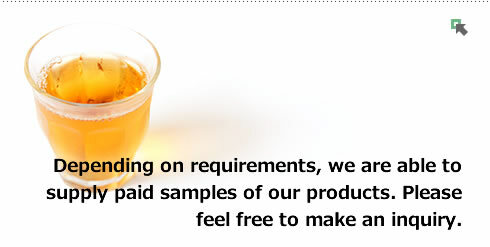 We want our customers to experience the taste of truly natural Japanese black tea. That wish is what makes out Organic Black Tea special. Left: A hot water infusion of Organic Black Tea infused. 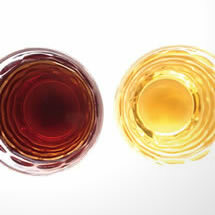 Right: A hot water infusion of Organic Black Tea infused. Many people feel unsatisfied with the taste of the black tea they usually drink. 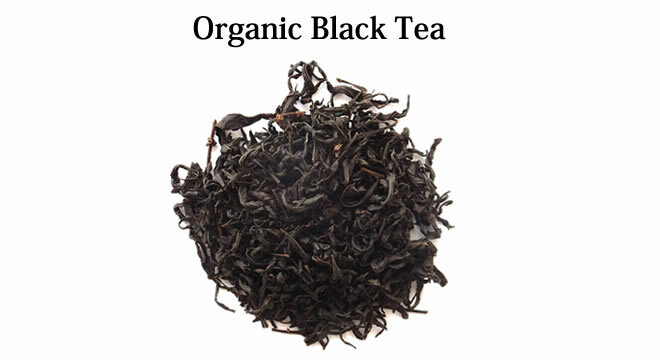 Our Organic Black Tea has pleasantly assertive tones with a quintessentially Japanese flavor. 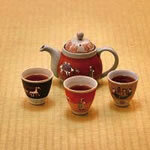 The refined feeling that comes with drinking black tea made from traditional Japanese tea leaves is not to be missed. 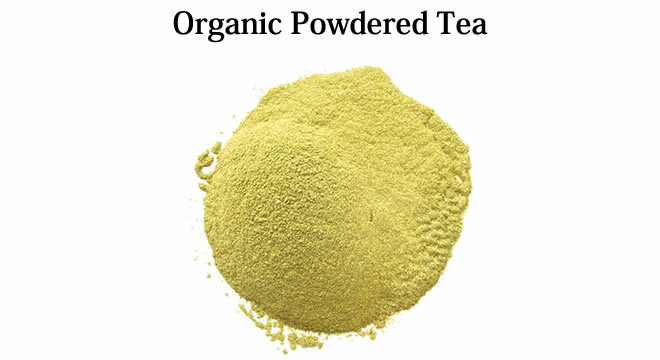 Our Organic Powdered Tea is made from our own Organic Tamaryoku-cha ground into a fine powder of between 50 to 200 mesh (fine to very fine), and can simply be dissolved in hot water and drunk as it is. Our Organic Powdered Tea is made from only the tea leaves themselves, so you can take in all the goodness of green tea without wasting a bit. Our Organic Powdered Tea is often used as an ingredient in "aojiru", a dark green health drink comprised mainly of kale, and also as raw ingredient in additive-free soaps. Overseas, our Organic Powdered Tea is sometimes swallowed in its powder form, or blended into smoothies, especially in Europe. We grind the green tea leaves just as they are – nothing added, nothing taken away. Our powdered tea is made only from organic green tea, so you can drink it with complete peace of mind. 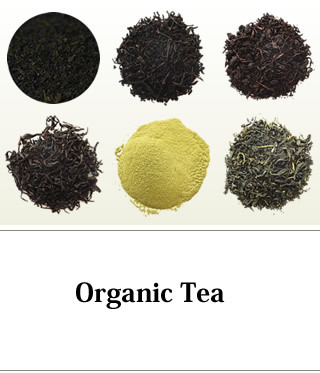 Unfortunately, we only accept orders for Organic Powdered Tea by phone or email, not through our webpage. Ara-cha (unrefined tea) is made from our Organic Tamaryoku-cha, but one stage removed from the final roasting that gives our Organic Tamaryoku-cha its deep color and flavor. 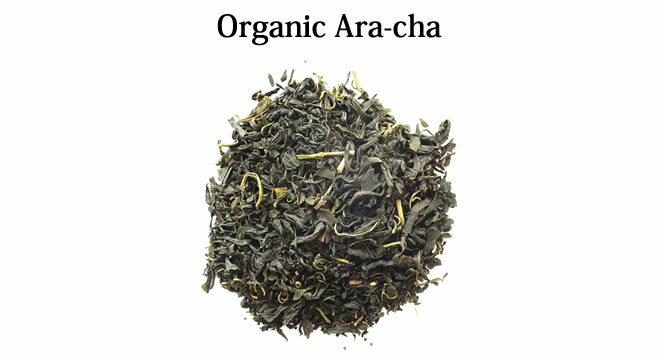 Ara-cha is usually not available for general sale, instead traded mostly as a raw ingredient. In 1975, the Ara-cha produced at Fujisako Tea Estate was shipped to big brand name tea manufacturers in areas like Shizuoka, Ureshino, Yame and Chiran, and used as a raw ingredient in other products. That Ara-cha was used in brand name teas nationwide under the names of major corporations. We desperately wanted our product to be recognized as organic tea, but at that time, and perhaps still now, the organic tea we made here in Sagara was blended with other teas. Regardless of whether the tea was organic or covered in pesticides, it was shipped and labeled "Product of Kumamoto." As with tea and other food items, stating the place of production is an absolute necessity. Nowadays, the Organic JAS mark gives the impression other makers’ products may be unsafe, and they can find the market difficult. The feature of Ara-cha is that it doesn’t really have any depth of flavor. At first, a lack depth may seem like a negative point, but many overseas customers aren’t yet at a stage where they can appreciate the depth of flavor and astringency of Japanese green tea. 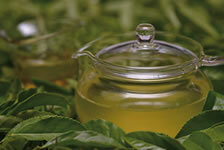 This means Ara-cha is well received by those who are new to green tea. It was actually when an overseas distributor appraised our Ara-cha and saw it as a beverage for general consumption that we considered supplying it to the general public. Perhaps there will come a day where powdered Ara-cha is consumed in the sushi restaurants of the world. Ara-cha can be enjoyed for its clear flavor and refreshing taste, even in a cold water infusion. The tea grown and processed at Fujisako Tea Estate can be used in a variety of ways. Tea has been consumed as a health drink for centuries, and our organically grown domestic species are high in anti-oxidants and a rich source of epicatechin gallete, a type of catechin. 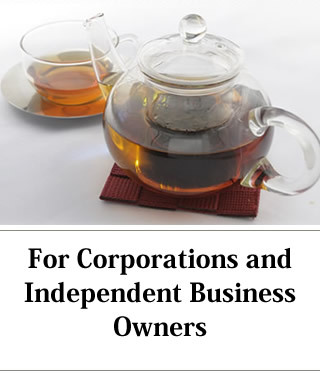 At Ochacha Honpo, we supply organic teas to corporations and independent business owners, as well as the general public. We are able to supply organic teas to meet the exact needs of our clients, which include eating establishments, companies for internal use, or to manufacturers as an ingredient in aojiru. We ourselves are frequent visitors to a wide range of eating establishments, but we have never been to one that served Japanese-made Oolong tea. 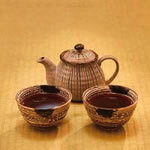 Oolong tea is the preferred beverage for diners who do not drink alcohol. Low prime cost Chinese-made Oolong tea supplied in a plastic bottle is served by many restaurateurs. As an even lower prime cost alternative, Chinese-made Oolong tea bags are used to make hot tea on site. No establishments we know of use domestically produced Organic Oolong Tea. The polyphenol contained in Oolong tea has fat-burning and anti-weight gain effects, and this is the basis for the great success of Oolong as a supposedly safe, healthy product. Restaurateurs are often proud to serve a particular brand of rice to their clientele, but they hardly ever mention where their tea comes from. To restaurateurs who believe complimentary tea is a way to reward their clientele, we say that good customers will come because of good quality, not freebies. More so than the use of pesticides and chemical fertilizers in rice production, the release of radioactive material after the March 11 disaster is a grave issue for Japanese society. We are thorough about the tea we grow at Fujisako Tea Estate being free from chemical fertilizers and pesticides. We are not only certified by the Japan Agricultural Standard (JAS), but we also conduct systematic inspections to test for radioactive material and residual pesticides. Just as with other food industries, the tea industry in particular cannot easily specify information on traceability (tracking the supply chain through all processes of production) within Japan to any degree of certainty. With so many distribution channels for each industry, and not forgetting the red tape that binds them all together, it can be difficult to consider just how the supply chain is related to consumers. 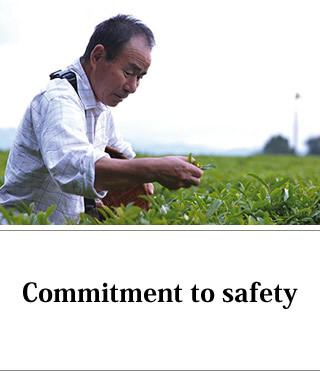 Just because we are JAS certified does not mean that all products of Kyushu are also safe. We believe it is our obligation as a producer and distributor to perform safety tests thoroughly and regularly. At Ochacha Honpo, we sell not only our own original products, but also accommodate private-label services. In Japan, Japanese tea is a beverage that is close to all our hearts, and now overseas Japanese tea is drawing significant attention as a "superfood." It’s for these reasons that demand for our organically grown teas is so high. We can offer total one-stop commodity planning and development for overseas private-labels, right from planning through to packaging. * We can arrange bulk delivery of organic tea leaves. In these cases, we kindly ask for our clients to arrange insurance at the delivery destination. We are able to supply corporations and independent business owners who are considering using organic tea as an ingredient in aojiru or dietary supplements. In addition, we can also act as a one-stop outlet, working closely with our partners to arrange blending for aojiru, or tablet pressing for dietary supplements. Please feel free to inquire about using organic green tea for private-label products. We can arrange for export to businesses overseas. 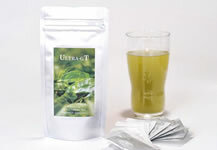 Please feel free to inquire if you are an overseas business looking to import Japanese organic green tea. Copyright (C) 2004-2019 Ochcha Honpo, plant-based soap and organic tea specialty store. All Rights Reserved.